Since this is a 16 channel mixer, there are 16 groups of inputs on the rear panel. Each input channel has a microphone input (XLR connector), a line input (1/4″ TRS phone connector), and an insert jack (1/4″ TRS phone connector). The microphone input is a balanced connection specifically designed for microphone cables and microphones, or other devices specifically designed for XLR inputs on audio mixers (such as the output of a direct box (DI box). No-No’s: Do not use this XLR connector for unbalanced connections. Since this connector can also supply phantom power to condenser microphones, if applied to unbalanced devices, the phantom power can damage the attached device and/or the audio mixer’s input circuitry. All unbalanced connections need to be applied to the 1/4″ connection. 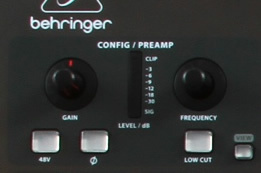 The line input is designed for devices that have a larger signal output (called line levels) than microphones, such as keyboards, guitar amplifier line outputs, computer audio interfaces, CD players, etc. On this particular audio mixer, this connection can accept either a balanced (TRS connector) or unbalanced (TS connector) connection. Do not use this connection for wired microphones. Wireless microphone line outputs can be connected here, though. TIP! Most, but not all, audio mixers have line input jacks that can accept both unbalanced or balanced connections. Consult the owner’s manual to determine whether your particular mixer has this feature, or by observing the labeling of the actual line input jack, if noted. The only other audio jacks we are concerned with, at this point, are the main audio outputs. On this particular audio mixer, the main outputs appear as a pair of 1/4″ phone jacks and a pair of XLR male connectors for utilizing separate Left and Right signals (for stereo use), or a single 1/4″ phone jack labeled Mono. So, let’s get started! For our first mixing task, I’m going to walk through the process of hooking up a single wired microphone, like found on a podium or lectern, to the audio mixer. I will also explain the proper procedure for setting the all-important input gain level for that channel using that particular microphone and audio source. TIP! For this example, it’s not necessary to connect the audio mixer’s main outputs to an amplifier or powered speaker setup, but you can if you would like. Use either the Main Out Mono connection, the Main Out Left XLR, or the Main Out 1/4″ output connection. We’ll cover output configurations and setups in a future article. Now, let’s hook up a wired, Shure SM-57 microphone into channel one’s XLR connector using a standard 25′ XLR microphone cable. This microphone can be mounted on a microphone stand, podium or lectern for use by a singer, pastor or speaker. Once the microphone is properly connected to the audio mixer’s channel one XLR connector, it’s time to properly set the channel’s input gain. TIP! As seen in the photo on the right, the Mackie 1604 audio mixer’s input gain control is labeled TRIM. On most audio mixers, this setting is labeled GAIN, but just note that different manufacturers may use different terminology. Also, this control is usually one of the first settings or controls in a channel strip. Channel strips are usually arranged with controls in the order of how the audio flows through the channel. Since the audio starts in the input amplifier, which the input TRIM or GAIN control regulates, this control appears first in the strip. Your mixer may also have other switches near this control, such as a MIC/LINE switch, +48V switch, HPF, Pad, etc. If you have any doubt about your particular audio mixer’s controls and settings related to the input gain, consult the owner’s manual. Properly setting this GAIN, or TRIM, control ensures we have the proper amount of audio voltage being sent to the other circuits within the channel strip, such as the AUX, EQ, and Fader circuits. If this level is not properly set, we run the risk of unnecessary noise being introduced into our audio signal later on (if the GAIN is too low), or audio distortion or clipping of the signal within the preamplifier or channel strip circuits. Before we begin to set the level, since this microphone will be used on a stand or lectern and will be used for speaking or singing, we probably need to engage the high pass filter on this channel. While this setting is usually located very close, or beside, the GAIN or TRIM control on most audio mixers, as you can see in the photo on the right, the Mackie 1604 has this switch located just below the LOW EQ control. It’s called LOW CUT (which is the same as High Pass). The purpose of this switch is to effectively filter out frequencies below a certain cutoff point for the purpose of removing rumbling noises from a stand-mounted microphone, especially from one mounted on a pulpit or lectern. You may have heard these when a speaker moves or vibrates a pulpit, or many times when someone walks around or near the pulpit, if the pulpit is not sitting on a very sturdy stage. By default, I would recommend this switch be engaged on every channel that has a microphone connected that will be used by a singer or speaker. Some singers may have voices that would benefit from this setting being off, but start with it on and then experiment later. Do not use this setting on certain instruments where filtering out the lower frequencies, or bass frequencies, would take away from the instrument’s sound in a negative way. Examples would be a kick drum, bass guitar, etc. But, use your ears to make the final judgement. Go ahead and make sure all of the AUX, EQ, and PAN settings are in their default positions as shown in the photo on the right. Also, make sure the channel fader (the large slide control at the bottom of the channel strip) is lowered to its minimum setting. Now, let’s start with the GAIN or TRIM control fully counter-clockwise, or sitting at the 8 o’clock position. This position provides the least amount of gain, and on many audio mixers, effectively cuts off the audio signal from entering the channel strip. To properly set the TRIM or GAIN control, we now need to have our singer or speaker either sing or speak into the microphone as they normally would. As you slowly turn the GAIN or TRIM control clockwise, you are now letting audio (voltage) enter the channel strip. No-No’s: It’s important to set the gain using the actual source that will be used on that channel. For the sound technician to set the gain with his or her own voice may be an okay start, but it’s not the correct method (I get nervous when I witness tech’s doing that). Set the gain using the actual singer, speaker, or musician that will be on each channel. This should be done during sound check. For the lead vocal channel, set the gain while the singer is singing as they will be singing in an actual service. For a microphone on an instrument, set the gain with the actual musician. Different musicians on the same instrument and same microphone will probably produce different volumes. The proper amount of audio in the channel strip is very important. And, knowing how much audio you have in the channel strip varies from mixer to mixer. In our example, the Mackie CR1604, there are two methods. First, within the channel strip, itself, is a two LED indicator that gives you an approximation of how close you are to getting the proper level. The green LED will illuminate when a certain amount of audio (-20 dB for this mixer) is present in the channel strip. A red LED illuminates when there is too much audio in the channel strip. So, in normal use, the green LED will be varying in brightness, and the red LED should not illuminate, or if it does, it should be very brief and very sporadic. But, just strive to avoid illuminating the red LED. The second method of determining the amount of audio in the Mackie CR1604 channel strip is to utilize the audio mixer’s main LED meter found within the master section (see photo below). To use this method, which is highly preferred, make sure the SOLO MODE switch found within the master section is set to PFL, or pre-fade listen. This setting will allow us to listen to, or, for our current need, measure the audio before it reaches the main channel fader (that we currently have set at a minimum value). Now, press the SOLO button on channel one. Now, you should see the audio level in channel one’s channel strip shown on the right LED meter. Adjust the channel TRIM control to increase or decrease the audio shown on the meter. The proper level is reached when the audio is averaging around the zero (0) mark and peaking up to +7, with very rare peaks up to +10. Care must be taken to ensure the channel has enough headroom in your adjustment. Does the singer or speaker have moments when they get stronger or louder? If so, your adjustment needs to allow for the signal to grow without peaking into the red LED. Singers are different, so these adjustments may be different for two different singers. One singer may be very dynamic, with periods of soft and loud volumes. Other singers may stay at one volume most of the time. So, be sure your adjustment of the TRIM 9or GAIN) control allows for short periods of higher audio levels, depending on the source. Once the input TRIM has been set using the main meter in SOLO mode, now disengage the SOLO switch on the channel. You can still monitor the channel strip audio level using the green and red LED’s on the individual channel, but without the detail of the LED metering. Also, bear in mind that gain control settings will vary from mixer to mixer. All mixers are different and the way this control is designed may confuse you when moving over to a new or unfamiliar audio mixer (see photo on right). On some mixers, this control doesn’t affect signals appearing at the line input jacks. Audio appearing on the line inputs will have a fixed level. Only the microphone inputs are adjustable. On other mixers, a PAD switch may be present that helps you control strong signal sources. Use the PAD switch when the TRIM or GAIN control has to be almost fully counter-clockwise to control the input signal. Consult your owner’s manual fro more information. On some mixers the TRIM or GAIN control won’t give you enough “gain” for some microphones or sources, even when you set it to its maximum, fully clockwise position. An example would be a ribbon-type microphone on a very soft, or timid, vocalist, or a very soft acoustic instrument. You would either have to make do with what you get, or you would have to use an external microphone preamplifier to get the gain the audio mixer won’t give you. These occurrences are probably very rare in the typical church setting, but it’s worth mentioning. No-No’s: A misconception in setting the TRIM or GAIN control (that I’ve heard from church sound techs and even read in a popular church tech publication) is that this control must be set very near the 12 o’clock position or it is set incorrectly. Let me just go on record and say that is not only false, but absurd. If that were true, this setting would be a switch and not a variable control. I understand where this thought came from, in that many owner’s manuals suggest you start with this setting at the 12 o’clock position. That’s not bad advice, but it is only a starting point. You have to realize that different microphones, DI boxes, and other sources have different output levels. Even with the same microphone, singers and speakers have different vocal volumes and timbres that react differently with a particular microphone. Did you know the output level of a Shure SM7B and a Shure SM-81 on the same singer would be drastically different and require two completely different TRIM settings? The TRIM setting on the SM-81 may be at the 9 o’clock position, while the SM7B may be at 4 o’clock…on the same singer! Are either one of those TRIM settings incorrect? NO! The microphones have different outputs that are normal for their design, and the TRIM control is designed to provide the proper audio level into the audio mixer’s channel strip. Now, an experienced sound technician will know if a particular TRIM setting is abnormal for a particular microphone or source, and then some troubleshooting may be required. But, do not be alarmed if your TRIM controls are not all in the same position on your audio mixer. Chances are, if they are all in the same position, you are doing something very wrong. No-No’s: Do not get in the habit of constantly adjusting this control. It should not be used to control the channel’s overall volume in the mix. That’s the purpose of the channel fader. While there will be instances on some sources where this control may need more attention than on other channels, it should be fairly rare. Again, this is a general rule, and certain sources may be exceptions. This setting may need to be changed anytime a different singer uses that channel, or, sometimes, between different songs. Pre-planning during sound check for proper gain settings are, or should be, a requirement. Some digital mixers can store these settings as a preset for each vocalist or instrument, regardless of what channel you put them on, making recall and workflow much easier. Now the TRIM control has been properly set for both our microphone and the singer/speaker. Repeat this same procedure for each channel, keeping in mind that this adjustment must leave some headroom for brief, dynamic increases in volume on that particular channel. Setting the input gain is one of the most important, if not the most important, steps in setting up your audio mixer. If this setting is incorrect, the steps taken from here will only degrade your audio fidelity. So, if this information is new to you, PRACTICE! Don’t forget to consult the owner’s manual to your particular audio mixer for additional details in the features your mixer has, including the manufacturer’s recommendations on proper gain settings. In the next article, we will now get this channel’s audio properly out of the mixer and to our speakers. We may make a few tweaks within the channel strip to improve the audio fidelity and send the audio out! I hope you are enjoying these articles. Thanks to those that have sent me pats-on-the-back and feedback. Your support is much appreciated. Please be sure to spread this blog to friends and people you would think would find it beneficial. They can enter their email address on this site to be automatically notified when new articles are published. Informative and helpful. There is a lot of misinformation on how to set the mic and making adjustments to sound.